A few hours later I’m still amazed – thank you for voting for me! There are so many amazing historical fiction blogs out there; it’s one of the most popular categories and I love so many of your blogs. You’re always inspiring me to seek out new historical fiction books and learn more about the world and the amazing story behind how we got where we are today. I’m so flattered and honored, thank you for choosing me. This post is really just an inarticulate way of saying thank you; thank you for sticking around throughout my various life changes, thank you for voting for me, thank you for reading my blog and taking the time to comment, and most of all thank you for inspiring me to keep reading no matter what else is happening. The book blogging community is awesome and I’m so grateful to be a part of it. And now that I’ve gushed at all of you, I’m off to go read more of your posts! Happy BBAW! I’ve withdrawn from the first one since I don’t think I’m really a romance blog, and because there are so many fantastic romance blogs that I’d be poor competition, but I’ve selected my five posts for each of the following three categories. I had the most fun easily with best general review blog, I have my favorite reviews and they’re not all historical fiction or history! Now I’m just crossing my fingers to see if I get moved on to the next round in any of them and doing my part to make the tough decision on my panel. I’d just like to reiterate my thanks, though, and tell you that I’m so flattered you all thought of me. I completely don’t deserve it but I’m thrilled nonetheless. Thank you! Aged only thirteen, Lady Eleanor de Clare is contracted into marriage by her father to Hugh le Despenser in order to pay a debt. Though nervous, especially on her wedding night, she and Hugh quickly fall in love. When her brother dies, Eleanor comes into a much greater inheritance than she or her comparatively lower status husband ever expected. As the niece of the king, Eleanor places Hugh in a position of great power and as he begins to take advantage of that, Eleanor’s loyalty is tested as she discovers what it’s like to be the wife of a traitor and the beloved niece of a failed king. This is one big, thick book. I liked that each chapter heading had the months and years covered because otherwise it would have been difficult to keep track of just how much time passes between events and there is a handy guide to all of the historical figures right at the beginning of the book. This is necessary to cover Eleanor’s life and relations. The author keeps to the more interesting parts, so while the book is long, the plot doesn’t bog down even when it moves more slowly and it isn’t too hard to keep track of who is who. By the end, I grew quite fond of the characters, particularly Eleanor. I found it impossible to like Hugh though. I know way too much about what he did, and I’m sure my opinion of him is colored by a particular professor’s attitude, to ever feel much sympathy for him. I did feel sorry for Eleanor. To me, it seems perfectly logical that Hugh would hide his nefarious doings from his wife, especially given they didn’t see each other all that often once he became powerful. I was surprised by feeling sorry for Edward II. I always have to some extent but never considered what his personality may have been like, mostly just thought of him as a very poor king. In any case, I could still feel for Eleanor and understand why she loved such men, which I thought was quite impressive considering I formed my opinion of these particular historical figures years ago. I did find one of her acts particularly unlikely and a little off-putting, but given the author says in the end note that there was a rumor about it at the time, I can’t argue with it except to say that if I was Eleanor I would NOT have done that. There was another rumor that I was hoping wouldn’t turn up, but it did. I know this is horribly vague, but I don’t want to give the story away. I can say that from what I know, Susan Higginbotham has done a terrific job with historical accuracy, and even if I squirm away from certain things or wouldn’t include them personally, there is basis for all of them. There is also one of those author’s notes which I love so much at the back of the book explaining what’s real and what’s not. So, now that I’ve ranted on about history, did I actually like the book? Yes, I did. It’s excellent for a historical saga and if you’re interested in medieval England in fiction, I’d highly recommend this work. Convincing characters, historical accuracy, deep plot with a fair share of scandal and excitement that kept my attention despite being long and familiar; this book is historical fiction worth reading. Buy The Traitor’s Wife on Amazon. Etta Place, notorious lover of the Sundance Kid, is one of history’s mysteries. Both her origins and her fate are completely unknown despite many guesses. Etta is given new life in this novel as a young Philadelphia debutante. Forced from her home at her father’s death, Lorinda Jameson becomes Etta Place and finds a refuge with scandalous criminals. A master horsewoman and sharpshooter with a gentle manner, Etta is perfect for assisting with train robberies and keeping hold of everyone’s money. Her circumstances constantly change, but Etta remains a strong, compassionate character throughout this engaging novel. In this novel, Etta’s imagined story is given life through fictional letters, diary entries, and newspaper clippings. Since so little is actually known about the real life Etta, I really liked this aspect of the book and felt that I could imagine these events actually happening more than if perhaps Kolpan had kept the story as a diary. The only ones I didn’t like were Harry Longbaugh’s letters to his father. In truth I didn’t really like Harry (the Sundance Kid) much himself. He remained a very shadowy character despite Etta’s love for him. The rest of the outlaws were similar, although I did like the women, Laura Bullion and the little Native American girl. In fact, I’d say the character of Etta is the best part of this novel. She is strong, compassionate, independent, and stubborn. She deals with each issue with grace and dignity, even when she is required to fight for her life. I think her character is really what holds this novel together. I also particularly enjoyed the inclusion of Eleanor Roosevelt. Although all of this is fictional, I quite liked the glimpse into what her youth may have been like. I also was glad that Etta spent time in the East so that the author could portray more of the country than the initial description seemed to entail. Overall, this was a pretty good work of historical fiction. The plot didn’t entirely captivate me and some of the characters were weak, but I enjoyed reading it. Buy Etta: A Novel on Amazon. I’m only going to tag for this last one, because I have seen the first two awards practically everywhere. And there are so many more that I almost decided to not list anyone! I figured I should share the love a little bit, though. A Huge Thank You For Amy! This summer, after book blogging was patronized in the mainstream media, Amy from My Friend Amy made a suggestion that we celebrate book blogging. From that idea, Book Blogger Appreciation Week was born. Many of us have participated in interviews, contests, give-aways, and through awards; but, this would never have happened were it not for the dream, perseverance, planning, hard work and dedication of Amy. This has been a wonderful week and as members of the Book Blogging community, in one voice we want to thank Amy for all that she has done. 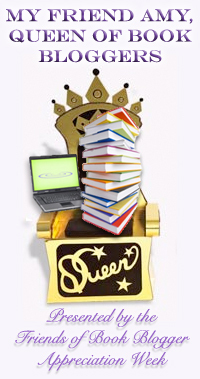 Amy, you are truly the Queen of Book Bloggers and we love you! I’m really just echoing what everyone else has said here – thank you, Amy, for this awesome week that has made us all feel appreciated and loved as well as led each of us to discover many new and fantastic book bloggers. I think we can all call you our friend after this week and we are so lucky to have you blogging with us! Thank you! Can you believe that I won? I certainly can’t! I’m beyond thrilled; I actually squealed with glee, out loud, and I don’t do that! So many thanks to everyone who voted for me and everyone who is reading my blog. It’s corny, but you all have really kept me blogging since I started over again and made this an amazing experience that I just want to continue, and despite my tentative hectic schedule for this coming year, you will find me here as often as I possibly can be. And probably with many more thoughts on history; I’m sure I’ll be reading far more non-fiction soon! 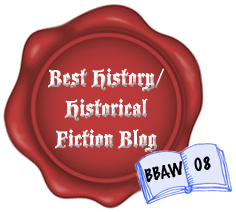 I also want to encourage you all to check out the other amazing blogs that were nominated in the History/Historical Fiction category. I’ve gone over to visit and added every single one of them to my Google Reader – I have no idea how I managed to win against them and I’m very glad to have discovered these blogs through BBAW. I’d also like to thank (this is sounding a lot like an acceptance speech now, isn’t it?) My Friend Amy for putting so much work and creativity into this fantastic week. I’m off to squeal with glee yet again and inform everyone that dares to speak to me, and then write some more reviews. So, as we probably all know, Book Blogger Appreciation Week has begun! Today Amy has asked us to highlight our favorite blogs that didn’t get nominated. A few of my favorites didn’t make the cut, so I’ll list them here to remind their authors that we still love them! Kathleen’s Book Reviews – Kathleen has been a great friend to me since I started blogging. She has encouraged me with constant comments, sent me a book that I was dying to read and couldn’t get myself, and has set an example with her great reviews. She hasn’t posted much lately so I think her life must be pretty busy, but she deserves the appreciation! Bookish Ruth – I think Ruth writes some great reviews, and I just loved her post about meeting Penelope Przekop. She’s friendly, enthusiastic about books, and welcoming. I always enjoy reading her blog, and if that’s not a good enough recommendation, what is? And I thought I’d spotlight an author blog as well – Brandon Sanderson’s blog. I have adored all of Brandon’s adult fantasy thus far and I’ve been trying (somewhat unsuccessfully) to get my hands on an ARC copy of the third book in his Mistborn trilogy. I was thrilled to discover that Brandon has a wonderful blog where he really connects with his readers and lets us know how things are going in his life and in his writing. It’s like we’re right there with him writing the final WoT book from Robert Jordan’s notes, and he’s got me planning my re-read already! If you like fantasy, or even if you don’t, you should read his books and his blog. There are, of course, many other blogs that I adore, but you’ve seen so many posts today that I kept it short.